UPDATE ~ This morning we went to La Colonnetta and spoke to one of the bartenders there about my bottle of Vodka and he told me that it isn’t tap water and that they have a machine that purifies the water and they can also make sparkling or frizzante water too. It’s true. He showed me the machine itself. How terrible did I feel… But I am glad I solved that mystery. Firstly, I’d like to say that I adored this little bar on one of the narrowest alley ways in Treviso. My husband and I frequented the bar a lot. And now, after my experience last Thursday, I am not sure if I will be back. 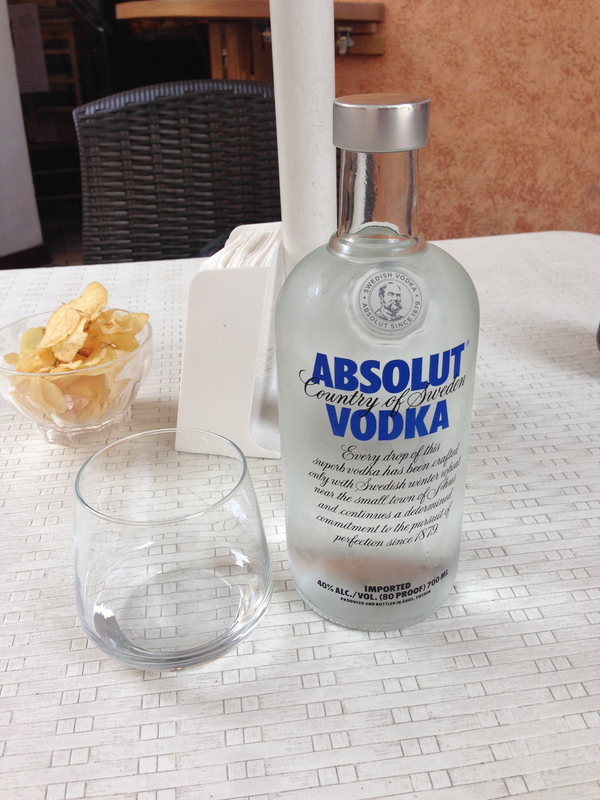 So, to set the scene, I met a friend in Treviso and we decided to go to La Colonnetta for a couple drinks. I asked for a bottle of natural water, and a glass of coca cola for my friend. Simple right? And yes, we both spoke in Italian to the owner;however, upon arriving we spoke in English. My friend being Italian but speaking a darn near perfect English accent and me of course “the american”. I am not sure if the owner thought that maybe we were just a bunch of tourists or what..
Just to let you guys know, when you order water in Italy, it is not FREE! It isn’t tap water, instead its a bottle of water from a decent brand served with a glass cup if you’d like. My friend and I both looked at each other slightly confused. I told him, that I ordered water not vodka and he said, “Yes, it’s water” But what happened to being served a bottle of water with the name of the brand on the bottle.. Instead what the owner did was serve me tap water in a old, reused bottle of Vodka and then he went ahead and charged me the same price for the tap water as if it was for the name brand of water. I’ve learned that complaining in Italy, only gets you so far. I thought it was borderline hilarious and rude at the same time. My husband who is Italian and from Treviso couldn’t believe that the owner would do something like so. I went back to La Colonnetta earlier this morning and they were closed. My husband and I wanted to see if they would serve us a bottle of water or a bottle of tap water in a old bottle of Vodka, but luckily for them, they were closed. BUT we will be back to see about that. After that experience, I wanted to let you know, if you are visiting Italy, don’t let the Italians serve you water from a used bottle. Make sure the lid hasn’t been opened and make sure its a name brand. And if they try to pull a fast one on you, complain anyways and tell them that you shouldn’t have to pay for tap water!